Funding: County Kildare Archaeological Society and the Kildare County Council Community Heritage Grant Scheme. 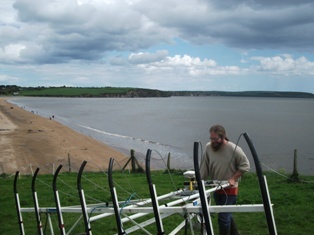 Aim: Earthsound Archaeological Geophysics were commissioned by Ms. C. McLoughlin of Stafford McLoughlin Archaeology on behalf of Wexford County Council to execute a geophysical survey in land adjacent to the Duncannon Bastion Fort as part of a conservation plan being carried with assistance from the Heritage Council, within the townland of Duncannon, Duncannon Village, County Wexford. The fort contains a church and a castle and it is believed that it may originally have been the site of a promontory fort owing to the derivation of the name meaning ‘Conan’s Fort’. Our main objectives were to determine the presence or absence of buildings and possibly grave plots associated with Duncannon Fort which are reputed to lie within the survey area and to investigate for any possible metallic artefacts which may be related to the usage of the fort. Earthsound carried out a comprehensive geophysical study of the site which included Magnetometry, Earth Resistance, Electromagnetic Induction and Metal Detection. Outcomes: The geophysical surveys have revealed an extensive range of potential archaeological features which suggest the presence of multi-phase occupation. This activity appears to be concentrated in the northern field, while the central and southern fields have been heavily impacted by later activity such as the construction of a cinder block wall and soil deposition. Within the northern field a series of parallel and interconnecting boundaries have been detected. These could relate to agricultural activity or be associated with habitation. A number of circular possible enclosures were identified. These are unlikely to be contemporary with the fort but may indicate occupation on the site prior to the installation of military activity. The presence of numerous possible pits and four possible industrial anomalies as well as a series of possible structures down the western extent of the northern field suggests a large amount of habitation activity once existed on the outer edge of the fort. When the geophysical results are combined with the metal detection ‘hits’ a complicated picture emerges suggesting that the fields, as well as being used for habitation, may have seen warfare or at least the practicing of warfare. © 2002- 2019 Earthsound Geophysics Ltd.